Circuit breakers, disconnectors, and switchgear in power transmission and distribution (T&D) operations have been using sulfur hexafluoride (SF6) as insulation for decades. To maintain the excellent thermal conductivity and dielectric strength of SF6, however, you must keep proper amounts of SF6, gas purity and minimize the amounts of humidity and byproducts inside the gas chamber. The wrong conditions can lead to malfunction of the equipment and can compromise the safety of the operation. Gas density evaluation is one of the best ways to assess leaks and changes in composition. Most operators nowadays monitor SF6-insulated equipment using gas density measuring instrumentation. To measure SF6 density, the instrumentation measures the actual pressure and temperature of the gas. Those pressure and temperature measurements are then used as input in an equation of state to obtain gas density. With the exact values of pressure and temperature, gas density can be accurately calculated. However, changes in gas temperature affect the pressure within the closed chamber, with higher temperatures leading to higher pressures. Consequently, the gas density calculated using temperature and pressure measurements is no longer accurate. Changes in gas temperature must be compensated for to restore accuracy. Bimetals translate temperature changes into changes in length using the expansion characteristics of different materials. Bellows measure the internal temperature directly using an external capillary temperature sensor. Electronic sensors measure temperature changes and give a temperature-compensated output. The GDHT-20 is a compact, comprehensive system with digital output that allows continuous monitoring of all relevant gas condition parameters. 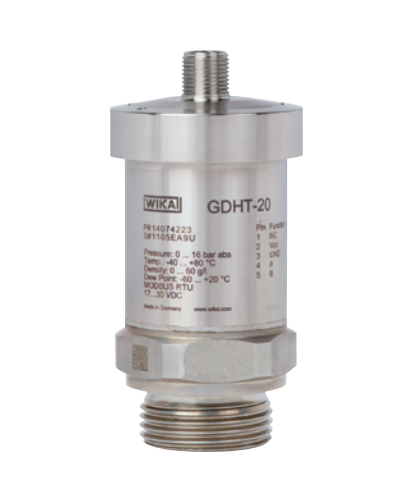 WIKA’s GDHT-20 is a multi-sensor digital gas pressure, temperature, humidity, and density transmitter. It measures gas temperature, pressure, and humidity inside the SF6 chamber. Based on these gas temperature and pressure measurements, a powerful microprocessor calculates gas density using a complex virial equation. The GDHT-20 uses three of the electronic sensors to measure and compensate for variations in gas temperature: one near the pressure measurement sensor, one near the humidity sensor, and a third one on the main electronics of the instrument. As a result, even the smallest variations in gas temperature are taken into account, and correct values of the different parameters are input into the equation of state. The actual gas density is calculated accurately. A product of advanced technology and streamlined design, the GDHT-20 has been developed in response to today’s market needs. It is a compact device, easy to implement in new and existing T&D environments. It has excellent signal stability and electromagnetic compatibility (EMC) characteristics. The GDHT-20 is reliable, accurate, maintenance free, and does not require recalibration. 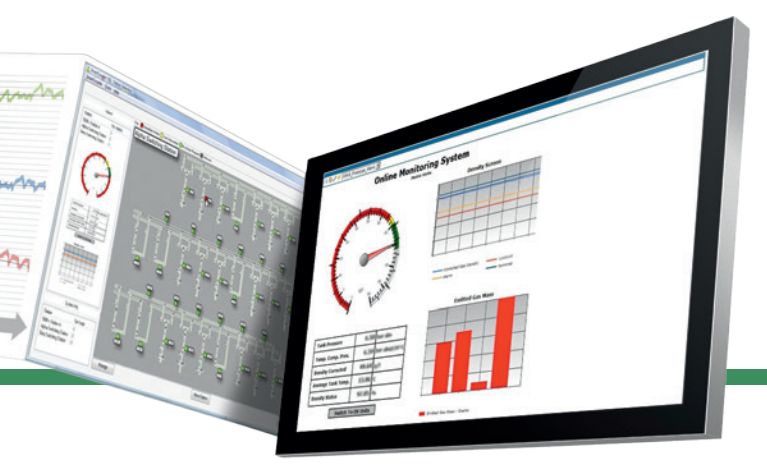 It communicates via the MODBUS RTU protocol, accommodating up to 247 transmitters in one bus. The GDHT-20 is best in class for continuous online monitoring of conditions in SF6-insulated equipment and ideal for smart grid applications. Call WIKA’s experts today to learn more about how to ensure the safety of your T&D operations with accurate gas density measurements of your SF6-insulated equipment.